Learning the basics of how to apply an epoxy garage floor coating isn’t hard. A quick search on the internet will reveal a list of simple 8 step plans to get it done or an abundance of short videos to watch. They make it look easy enough, but what is more difficult, however, is learning about the finer details of applying an epoxy coating once you decide to get started. That’s when you realize that you have more questions than answers. This DIY garage floor epoxy application guide is designed as one of the more comprehensive and detailed instruction manuals on how to epoxy coat a garage floor. 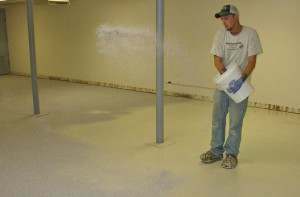 We will cover the application process of a multiple coat floor system that consists of a primer coat, 100% solids epoxy base coat (with or without color flakes), and a clear polyurethane, polyurea, or epoxy top coat. You can still use it as a guide for the application of the single coat 100% solids epoxy garage floor kits or for the DIY quick cure polyurea and polyaspartic one day floor coatings as well. Our ultimate goal is to help our readers benefit from these epoxy floor application tips in order to achieve a successful garage floor coating that looks fantastic and doesn’t suffer from the typical problems associated with poor flooring preparation and applicator errors. Though the steps required might seem complex at first, when you break it down and read about the various tips, you will find that it really isn’t that complex at all — just thorough. While the actual application of the coating can be applied by one person, we highly recommend using a minimum of two people. This is due to the fact that epoxy flooring systems are time sensitive during the application process. Two or more installers reduce the chance of errors and insure that you can cover a larger area of your garage floor in a shorter amount of time as compared to one person. If you are installing a DIY single coat epoxy paint kit such as those by Rust-Oleum, Quikrete, or Valspar, you can still follow most of this guide with exception to the way it is applied to the floor. Because these kits are water or solvent based, they go down much thinner and have a longer pot life that allows you to work with a roller out of a paint tray. Note: Please be aware that this guide does not overrule any specific instructions provided by the manufacturer. If in doubt, always contact the manufacturer with any questions that you may have. The single biggest reason that garage floor coatings fail is due to poor floor preparation. This is where all the hard work is at and is why it is so important to learn how to do it properly. Many times a good epoxy product is put to blame when actually it was the fault of applying it to a poorly prepared surface. The second reason for failure is applicator error. This usually occurs because many epoxy floor coating instructions are rather vague and not detailed enough. When this happens, the DIY installer is left to guess and fill in the details for him or herself. Applicator error is reduced significantly when you better understand the process of applying a floor coating or epoxy paint product. A very important tip is to thoroughly read through the application instructions at least twice before starting your project. If you have any questions, call the vendor where the product was purchased or the manufacturer of the product. Most provide toll free numbers to help with these application questions. Note: As you read through the following application procedures, many of the steps involved will have a red highlighted link that will take you to a separate article that either breaks down a particular step further or gives a better explanation of what may be required. Please make sure to follow these links. Before you purchase your epoxy, the first thing you want to do is inspect the garage floor to make sure the concrete will accept a floor coating. Epoxy will not adhere to sealed or painted concrete. This also includes any cure and seal product that was applied to the concrete after it was poured. If you do have a sealer of some type, it will need to be removed first by mechanical means such as grinding. You can test for sealers that may be present in bare concrete by sprinkling water on the surface. If the water beads up immediately without turning the surface darker, then you most likely have a sealer that will need to be removed. If the water doesn’t bead and the concrete turns darker as the water slowly soaks into the concrete, then no sealer is present. If you still are not sure that your garage floor is sealed and you have planned on acid etching the concrete for the surface preparation, then go ahead and apply some acid etch to a small area to test it. If it begins to turn yellow and fizz then you do not have sealed concrete. If the acid just sits there with little to no reaction, then you have a sealer on the concrete. Make note of any cracks, pitting, or spalling that needs to be repaired. Though epoxy is self-leveling, it will not fill-in cracks. If you have extensive cracks or repairs that need to be made, you may want to consider an optional garage floor covering such as interlocking tile or garage floor mats instead. For newly poured concrete, you need to let it cure for a minimum of 30 days for a typical 4” thick slab. 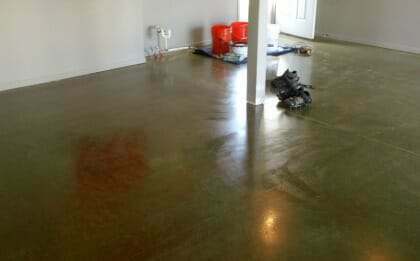 Curing concrete is still releasing moisture and will cause the floor coating to delaminate if installed too early. The next step is to conduct a moisture test and inspect the garage floor for any signs of visible moisture. What you should be looking for are areas of damp concrete or efflorescence. Efflorescence is a white powdery substance that is formed on the surface when moisture rising up from beneath the slab reacts with excess lime and salts in the concrete. When the moisture evaporates, it leaves behind the white residue. Efflorescence can also form due to the concrete collecting moisture at the surface from condensation if you live in a humid area. 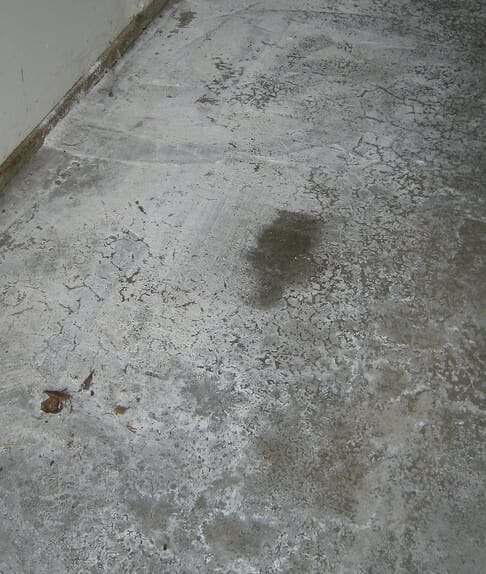 Efflorescence from condensation will not affect a garage floor coating once it is removed before the application of epoxy. If there are visible signs of moisture you will want to conduct a calcium chloride test to see if your garage floor will qualify for an epoxy coating. 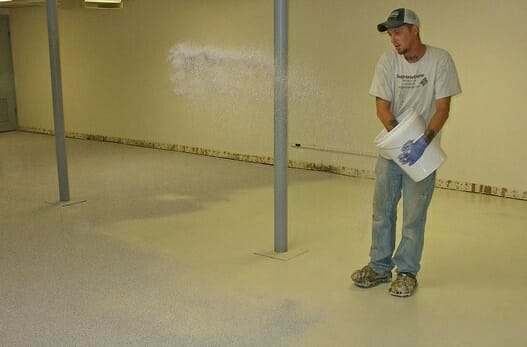 Most commercial epoxy products can withstand up to 4 lbs of moisture flow per 1000ft² per 24 hours. Always consult with the epoxy manufacturer first concerning the results of your calcium chloride test if you have moisture issues. Even if the garage floor looks dry, moisture could be evaporating off the surface quicker than it can form and not be visible to the naked eye. At the minimum, you want to do the plastic sheet test if the concrete doesn’t show any visible signs of moisture. Once you have decided that the garage floor will accept an epoxy coating, the next step is to clean the surface of the garage floor. If the floor is new or free from any oils or greasy residues, then you can just sweep it good and continue on to the next step. It’s important to remove any oil or grease stains from the concrete and pay particular attention to areas that may have absorbed tire dressing. These areas will act like a sealer by repelling water and will not allow the epoxy to adhere properly. This includes old glue and mastics as well. If you need to protect your walls from water while cleaning, it’s a good idea to tape up some cheap plastic drop cloths to the wall at this time. Once the concrete is clean, the next step is to profile the garage floor. Profiling is the process of exposing the pores in the surface of the concrete for the epoxy to flow into and make a good bond. This is the most important part of garage floor prep. You can choose to either acid etch or grind the surface of your garage floor to achieve the proper profile. Grinding the floor is the preferred method by most professional installers and epoxy manufacturers, but a proper acid etch is adequate for most applications. You can learn how grind a garage floor here and how to acid etch a garage floor here. Make sure to vacuum the entire floor with a good shop vac thoroughly after grinding. You should be able to run your fingers over the concrete without the finger tips getting very white. If there is dust, you have not vacuumed well enough. Note: Once your floor is clean, treat it as a “clean room”. Keep away dirty or greasy power cords, dirty shoes, or anything else that is potentially dirty that may contact and contaminate the floor. Any small amount of greasy or oily contaminants can create “fish eyes” in the coating. If you decide to acid etch, make sure to allow the garage floor enough time to dry completely before applying the epoxy. If you don’t, moisture being released from within the concrete can create bubbles and possible delamination issues. Unless you are using a water based epoxy primer that allows for application on damp floors for your first coat, you will need a minimum of 24 to 48 hours for the floor to dry completely, sometimes longer if the weather is more humid. Use fans if necessary to help facilitate the process. Tip: A good way to reduce the chance of air bubbles forming in the first coat of epoxy is to apply it in the late afternoon or early evening after the temperatures have started falling. Also, be aware that pressure washers drive moisture much deaper into the concrete requireing more time for it to dry out. Once the floor is profiled, the next step is to make repairs to the garage floor where needed. Do not use a latex crack repair product when applying a garage floor coating. Latex products are soft relative to the concrete and the epoxy. Additionally, latex repair products will shrink as they age and can create a depression underneath the floor coating that can highlight the repair. It will also cause the epoxy coating to crack under pressure since epoxy is not flexible. If you are opting for the seamless floor look and you want to fill in your contraction joints, now is the time to do that. Remember that when making crack repairs or going for the seamless look, it is very important to make sure that the surface of the affected areas of the garage floor is smooth and flat. If not, the repaired areas and seams can telegraph through the coating and reveal themselves. The best way to do this is to grind these areas after the repair has cured in order to create a smooth and even transition that will not show through. If you have done extensive repairs, one tip is to go heavy with the color flakes if you are applying them. The layers of flakes do a good job of hiding all the imperfections in the concrete. The following is a list of tools and supplies that you will need. 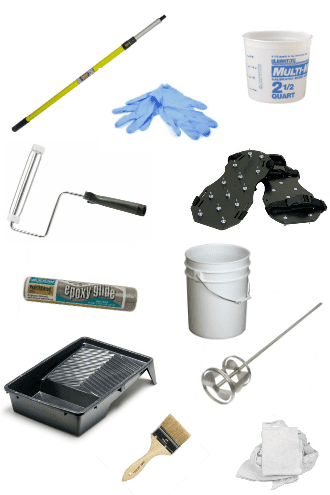 If you are purchasing a garage floor epoxy kit from an online vendor, some of these tools and supplies may be included with the kit. We also included optional tools such as 18” rollers. They are not mandatory, but the wider rollers make the application process much quicker. We highly recommend these if you are covering areas larger than 500 ft². The 18” roller frames, rollers, spiked shoes, and paint tray will most likely need to be purchased online if your kit does not come with them. Most home improvement centers do not carry them. These products greatly improve the speed and ease of applying a garage floor coating. Spiked shoes allow you to walk out onto the coating during installation and for tossing the color flakes. We recommend a pair for each installer. Tip: Do not go cheap with the rollers and never try to reuse them for additional coats. Use premium lint free products to ensure a blemish free coating. Also, having 1 extra is a good idea. You can always return what you don’t use. There is one note we want to make you aware of when it comes to the application of epoxy. Many of the videos that you can watch online showing the epoxy application process do not use 100% solids epoxy. Many are using a thinner water or solvent based epoxy that can be rolled out of a paint tray like you are painting a wall. The video shown below is an example of this, but it still does a good job of giving you an idea of what is required. 100% solids epoxy is much thicker and requires that you pour the epoxy out onto the floor and use back rolling as the final process. That is the method that we discuss here. Once the floor is properly prepared, now is the time to double check your materials list, required tools, check the weather, insure that you have a proper work station for mixing, and go over your game plan. If your garage floor extends out past the garage door and doesn’t end at a slab joint, you will want to tape off the floor where the garage door seal meets the floor. Remember that you will need to remove the tape about 30 minutes after the epoxy has set. If not, the epoxy will be too hard and you will have torn tape residue in your clean line. You will need to re-tape for each additional coat. Tape residue is not a big issue if you plan on installing a garage floor door seal afterwards since it can be installed over the tape line. Epoxy is influenced by weather and can affect curing times, viscosity, and adhesion. This is why temperature and humidity play an important role when applying epoxy to your garage floor and why you want to check the forecast before you start. Most epoxy paint coatings can be applied in temperatures from 55 to 90 degrees, with temperatures between 70 and 80 degrees considered ideal. Since epoxy cures exothermically, your working pot life shortens as the temperatures rise and lengthens if it is cooler. Please read up on applying epoxy in cool temperatures if you are worried that it may not be warm enough to install properly. Tip: Store your epoxy materials in a cool area 24 hours prior to mixing if you are forecasting warmer temperatures. The cooler epoxy will help increase the working time. Conversely, store them in a warm area if you are expecting cooler temperatures. This will help keep the epoxy more viscous during application. Humidity and dew point are important factors as well. Do not apply epoxy if the humidity is forecast to be over 85% and/or the temperature of the substrate (concrete) is 5 degrees or less above the dew point. A very thin film of moisture can form in these conditions and have an adverse effect on how the epoxy bonds to the surface. It can also cause blushing of the epoxy as it cures. Always check with the epoxy manufacturer first as these guidelines are general in nature. 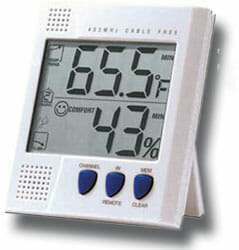 If you know that the conditions may change to put you outside these parameters, then you should delay installation. Tip: If conditions do change during the application and you are worried about moisture, run a fan in the garage while applying the epoxy. The moving air will not condense on the surface. These epoxy mixing instructions apply to each coat that you will be applying to your garage floor. Always consult with the manufacturer’s instructions first. Before you start, lay the tarp down on your driveway just in front of the garage to establish your mixing work area. It’s a good idea to tape the edge of the tarp down to the edge of the garage floor to ensure nothing is spilled on the driveway. Make sure all the tools, supplies, and cleaning materials that you will need are laid out and available. Now is a good time to put on the latex gloves and spiked shoes. Tip: Spiked shoes can be slippery when walking on the coating. Make careful and deliberate steps. Before mixing, check to see if any settling has occurred in the containers from sitting. If so, mix separately the Part A resin and Part B hardener in their respective containers to evenly distribute the contents. Unless you are dealing with large 5 gallon units, it’s easiest to mix Part A and Part B containers by hand using separate stir sticks. Be careful. If you introduce residue from Part A to Part B or vice versa, you will start the chemical reaction. A paddle mixer should be used for 5 gallon units, but you must clean it well between each mixing or use separate paddles. Note: Most kits come in 1½ gallon components – 1 gallon Part A resin to ½ gallon Part B hardener. Unless otherwise stated by the manufacturer, do not mix more than that together at one time. Because epoxy is exothermic, mixing higher volumes can severely reduce pot life and not allow enough time for application. If the size of your floor requires using more than one container of Part A and Part B per coating, it is recommended to batch mix. This is done by pouring all containers of Part A and Part B for the coating into individual buckets to mix separately. This will ensure that you get both product and color uniformity. If you are using color packets for pigment, add them to the Part A resin to mix in for color uniformity. Start by pouring the Part B hardener into a 5 gallon mixing bucket first followed by the Part A resin. The Part B hardener is lower in weight and viscosity than the more sticky Part A resin and will flow up and around the sides of the bucket while pouring in the Part A. This greatly reduces the inconvenience of separating the sticky Part A from the sides and bottom of the bucket as you are mixing. If it’s the final coat and you are using an anti-slip additive, now is the time to add that as well. If you are doing your garage floor in smaller, separate sections, or you have batch mixed the epoxy for each coat, you will not be mixing the entire batch of Parts A and B at once. Measure off the appropriate amounts of Part A and Part B that is required for that section into separate calibrated containers and then pour these into your mixing bucket when you are ready. 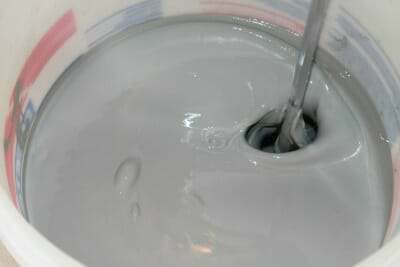 Using your mixing paddle and drill, slowly start mixing the epoxy for a minimum of two minutes. Be sure to work the bottom and edges of the bucket to ensure the entire contents of each part are mixed. The colored veins need to disappear. If the two components are not mixed completely the epoxy will not cross-link well and can develop curing problems that will lead to a substandard coating. It’s very important when mixing not to run the drill too fast or pump the mixing paddle up and down. Doing either of these this will introduce air into the mix which will be rolled into the coating and create air bubbles at the surface. The epoxy should have a nice even consistency without any color streaks. Tip: Remember to start the clock when you begin mixing since this is when the chemical reaction begins and is the official start of your pot life (epoxy working time). It is extremely important to follow the manufacturer’s directions when mixing the epoxy. If mixing smaller quantities, all measurements should be exact. If you are using something other than 100% solids epoxy, check the manufacturer’s instructions about induction time. The mix may need to sit for a required amount of time before applying to the concrete. Failure to do so can lead to a coating that will not harden properly. Note: When using 100% solids epoxy, pour the epoxy out on the floor immediately after mixing and do not let the epoxy sit in the bucket. Leaving it in the bucket for as little as a minute or two can shorten the pot life by half or more. Depending on which epoxy system you are installing, your first coat will be a primer coat or the color base coat. Contingent on the manufacturer, you will have approximately a 40 minute working window during ideal conditions. This window will shorten if the temperatures are warmer than ideal and lengthen if it’s cooler. Pay close attention to this window. Make sure your chip brushes, rollers, and epoxy are staged and ready to go. If this is your color coat and you are applying vinyl color flakes, make sure they are staged and ready as well. Tip: Before mixing your epoxy, use a strip of painters tape or duct tape and run the roller over it to remove any lint that may be present. You don’t want this showing up in your floor. After the epoxy is mixed, immediately start pouring it out in a 1”-2” ribbon along the back border of the designated section that it was mixed for. Continue working the ribbon back and forth across the entire section until it’s all poured out. If working without contraction joints or saw cuts for a border, do not pour the mix out over the minimum coverage rate for the amount mixed. For example, if you mixed 1.5 gallons to cover 200ft² – 250ft², pour the entire amount of epoxy out in ribbons over 200ft² of floor. Because it’s the first coat and you don’t know how much epoxy the concrete will soak up initially, it’s best to start rolling for 200ft² of coverage first. If you have additional epoxy left over after rolling the 200ft², continue rolling on the additional 50ft² if it allows without stretching it. Once poured out on the floor, start in the back corner and begin rolling it out. Be sure to preload your roller with a ribbon of epoxy first. This will remove air in the roller and alleviate the chances of rolling air bubbles into the coating. Take care to keep the roller loaded at all times. It’s OK to roll rather quickly. Tip: Pay attention to the sound of the roller. A quite roller means the epoxy is going on thick while a loud roller means it’s going on thin. While the epoxy is being rolled out, the second installer should preload the chip brush and with his spiked shoes on, start cutting in at the edges. Once done, he can be ready to start mixing another batch of epoxy or start applying the optional vinyl paint chips over the parts of the floor that have been back rolled already. Once you are done rolling out a section, it’s time to start back rolling. Back rolling the epoxy is important because it helps to eliminate bubbles, roller marks, application imperfections, and provides for a uniform thickness of the epoxy. Start the back rolling process by rolling forward and then rolling back on the same track in a direction that is perpendicular (90 degrees) to the direction the epoxy was initially rolled out. Cover about 6’ or more in your pass letting the natural weight of the roller do the work. Make a second pass if necessary to smooth the epoxy out. At the end of your back roll, pick the roller up and move it over for your next pass while making sure to overlap the prior one. Continue across the floor this way until you need to start a new row, making sure the new row overlaps the prior row. It’s OK to walk on a back rolled section in your spiked shoes if necessary. If you are using the 18” rollers, the initial application and back rolling will go almost twice as fast as the 9” rollers. It also reduces the amount of chances by half to create a roller line in the epoxy. Note: Check with the epoxy manufacturer about back rolling as some require that you make a second pass after a predetermined amount of time. If your first coat is the primer coat, it’s OK to spread it out a bit thin if you feel as though you are running out before you complete your first section or the entire floor. This can happen if the floor is more porous in certain areas and soaks up more primer. Do not spread the epoxy thin if it’s the color coat however. The color coat is the high build coat. Spreading it thin will decrease the durability of the floor and the appearance will be less glossy which is noticeable. Don’t worry about the contraction joints or saw cuts when rolling. The roller should pull any additional epoxy out of the joint as long as they are not too deep. If the roller doesn’t, you can use the chip brush to push the additional epoxy out of the joints as you roll. Also, touch up any areas that need it immediately. If you wait till the back rolling is done before you touch up, the epoxy can become somewhat tacky and make the touched up area look worse. Tip: When touching up a spot, do a complete back roll over the spot if you can. If you try to fix the spot with one quick pass of the roller, it can look different than the surrounding area when it cures. If working alone, cut in with the chip brush first after pouring out the epoxy onto the floor. Work quickly and start rolling the epoxy after cutting in. After you are done back rolling you can start tossing color flakes if you are using them. As long as you keep your sections small (100ft² – 125ft²) you should be able to complete the section within your working window. Any remaining epoxy on the floor can be scooped up with a wide putty knife, drywall taping knife, or old dustpan and deposited into the mixing bucket for disposal. When done, you now have time to cleanup while your first coat cures. Remove the roller from the frame and throw it into the mixing bucket just used. Throw the chip brush in there as well and let it all harden before dumping it in the trash. Use your rags and cleaning solvent to clean your spiked shoes, squeegee, roller frames, mixing paddle, and anything else that may have collected epoxy during the process. Many times a garage floor can be divided up into smaller sections. 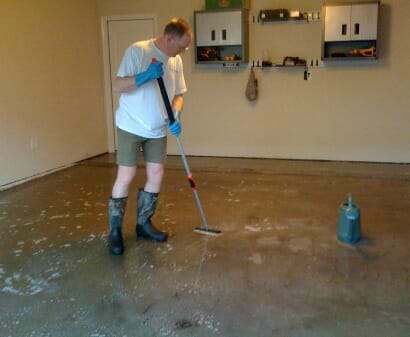 This is generally done if you are going to be applying the garage floor coating by yourself. The best way to do this is to use the garage floor contraction joints or saw cuts as the natural divider. Figure out the square footage for each smaller section and adjust your epoxy mix accordingly. If you don’t use these joints or you are going for the seamless garage floor look, you will need to have a newly mixed batch poured out onto the garage floor just as you are finishing the back roll of the previously mixed batch. Since it only takes a few minutes to mix a batch of epoxy, have a second helper do this just as you are finishing the back roll of the current section. When doing this, it’s important to keep a wet edge going at all times. If you don’t get the next batch down in time, it will create an overlap of one section onto the other that will be visible in the coating. Also, it’s best to keep your wet edge as short as possible. If the garage floor is much more wide than deep for example, work from side to side instead of front to back. This will provide for a shorter wet edge to worry about. Working in this method, it’s fairly easy to cover very large areas of flooring when two or more people are involved in the process. After each coating it’s important to take steps to prevent bugs and other critters from getting into your coating while it cures, particularly if it’s the final coat. This can be very important depending on what area of the country you live in. You also want to prevent dust or leaves from blowing in underneath the garage door and getting into the coating as well. The best way to do this is to close the garage door to within a foot or so from the floor once done. Do not let the garage door seal come in contact with the epoxy. Use a cheap plastic drop cloth and tape it to the garage door, the floor, and the edges of the garage opening to form a nice seal. This will prevent dust, bugs, and crawling critters from getting onto your floor and getting stuck while it cures. Once your first coat of epoxy is applied, you will have a general window of 10 to 24 hours before applying your second coat. This is based on ideal temperatures. These times can change by a few hours depending on temperature. Always check with the manufacturer for recoat times. There are exceptions, however, with certain types of coatings. Some polyurea and polyaspartic coatings can be recoated in as little as one hour. Other coatings such as RockSolid Polycuramine allow for up to 7 days to recoat. You can test the epoxy to see if it’s ready to recoat by using the thumb print method. Do this by pressing your thumb down onto the surface. It should not leave a thumb print or feel real tacky to the touch. If it does then it is not ready for a recoat yet. If you are doing a top coat on the color coat, be careful about trying to get on the floor too soon. Unlike the thinner primer coat, the color coat is a high build coat and if you are out on the floor too soon with spiked shoes, you will leave spike marks all over the floor. If you wait longer than the prescribed recoat window, you will need to roughen up the surface of the coating before applying another coat. You can do this by using 100 grit sandpaper on the surface and then wiping it down with denatured alcohol. Your second coat will be the color coat or top coat depending on which epoxy floor system you are installing. The mixing and application instructions are the same as the first coat if you are using epoxy. One exception to the second coat is that you don’t have to worry about how much epoxy may be absorbed by porous concrete. Because it is being applied over another layer of epoxy, the coverage rate for this coat will be very consistent. Since this is your high build coat, pay particular attention to covering only the square footage it was mixed for in order to ensure the maximum dry film thickness as advertised by the epoxy manufacturer. Once done, make sure to seal up the garage to protect the coating from bugs and debris as before. You need to start applying the vinyl color flakes after you finish back rolling each mix of your color coat. Do not stress about getting all the flakes applied within the working window of the epoxy. As long as you start applying them within 10 minutes after the final back roll of each section you will be OK. You can learn more about color flakes and how they are applied here. Unless you are coating small sections at a time, make sure you have your spiked shoes on so that you can walk out onto the floor. Be careful not to slip and leave long streak marks that you will have to repair by back rolling. The small marks from walking with the spikes will close up on their own. If you are broadcasting the vinyl color flakes to full refusal, it’s a good idea to wait another 10 minutes or so after you are done to check for bare spots that may occur from the flakes sinking into the epoxy. Reapply as necessary. If doing a partial color flake floor, divide up your total mix of color flakes into the same amount of sections that you epoxy coat. That way your garage floor will get an even distribution of color flakes from one section to the next. If you have broadcast to full refusal, you don’t need to worry about getting the top coat on within 24 hours. The rough vinyl chip surface is what the top coat will adhere to, not the curing epoxy surface. Tip: When doing a partial coverage floor, don’t use the last color flakes in the bottom of your bucket if you can help it. These are generally the smaller, broken flakes which will stand out if applied next to the full flakes on the floor. If you are using epoxy for your top coat, mix and apply the epoxy just as you would your color coat. If you have planned on using a non-slip additive, now is the time to introduce it into your mix. Because the epoxy is clear in color and harder to see, you may need to lean down and check your work at different angles to make sure you don’t miss any spots. This is important in order to get the surface back rolled properly. If you are using polyurethane instead of epoxy for your top coat, the mixing and the addition of a non-slip additive is the same, but the application process is a little bit different. Polyurethane is designed to be rolled onto the floor out of a paint tray instead of being poured onto the floor like epoxy. It has a much longer pot life, 2 to 4 hours depending on temperature, so you don’t have to worry about rushing it. Note: Be aware that the coverage rate for the first top coat of epoxy or polyurethane on a full color flake floor will be less due to all the voids between the layers of paint chips that the coating will fill in. Once mixed, pour the polyurethane into a paint tray and start with one person cutting in along the walls with the chip brush while another rolls the floor out of the paint tray. If you are applying it by yourself, don’t cut in for more than 10 minutes or so before rolling because you want to keep a wet edge at all times. Double check to make sure you haven’t missed any areas as you go along. It can sometimes be difficult to see the clear coating as it goes down depending on the light. Once you have done a small section, back roll the polyurethane just as you would the epoxy. Continue on with cutting in and rolling until the floor is complete. 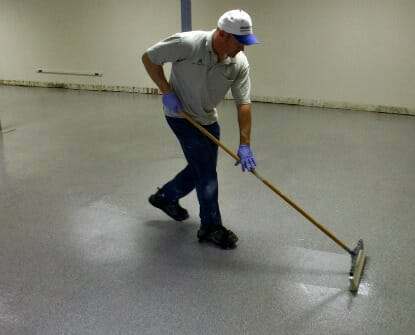 Because polyurethane has a 2 to 3 mil dry film thickness, one coat on a full color flake floor is not enough. It will produce a very thin, rough coat because of the texture from the layers of color flakes. Two coats are the minimum recommended to produce the desired protection. Three coats are better. Do not attempt to apply polyurethane on real thick like epoxy. If you do, it can develop an orange peel affect, roller marks, and even look cloudy. This is why we recommend to use a 1/4” nap roller to apply it and not a 3/8” nap roller. Note: Pay close attention to the technical information when applying polyurethane. Some of the best products are solvent based and can have a high VOC content. Make sure to extinguish any open flames and use a respirator when applying it. Whether you are doing a single coat epoxy floor coating or multiple coats, anti-slip additives should almost always be added to the last and final coat. The most effective method is to add the anti-slip additive to the mix bucket as you are mixing the Part A and Part B of your final coat. If you are using a polyurethane coating or solvent based coating that allows the use of a paint tray, do not let the mixed material sit in the tray too long or it will sink to the bottom and the roller will not pick it up. You can read more about how to use ant-slip additives and what types are available here. 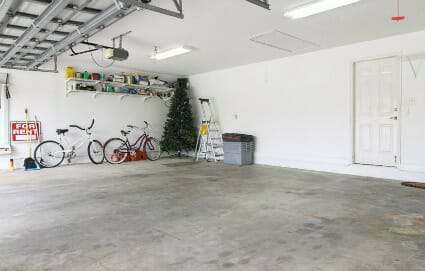 Many times questions come up about coating the stem walls of a garage. These are the raised concrete or block supporting structure that runs the perimeter of the garage floor. You can easily coat these as well; just remember to account for the additional epoxy required. Many times they don’t require much prep because they do not have a smooth surface like the floor. Just pour the mixed epoxy out on the top of the stem wall (do not keep it in the bucket) and apply with a chip brush or small paint roller. Always do the stem walls first with each coat you apply to the floor. If you plan on applying color flakes to the wall, you will have to toss them at the wall fairly aggressively in order to get them to stick properly. The trick is to use much smaller handfuls if you are doing a partial coverage floor. As a tip, if you don’t feel the need to apply color flakes to the stem wall, some people elect to color match their epoxy with a simple 1 Part epoxy paint or concrete floor paint. They then use that for the stem wall without a clear coat. These are less expensive than a good 2 part epoxy and very easy to apply. Plus, you are not walking on your stem walls so you do not have to worry about durability. Once the final top coat is applied, you need to wait a minimum of 18 – 24 hours before the floor can accept foot traffic. Wait an additional 24 hours before moving things back onto the floor, and a total of 72 hours before vehicle traffic. Remember that the epoxy floor coating will cure slower when temperatures are cooler than ideal, so you should adjust your wait times accordingly. It takes approximately 7 days for the garage floor coating to harden to its full strength. When purchasing your epoxy it’s very important to make sure that you have enough to cover the entire garage floor. This is especially true if you elect not to use a primer coat. Some concrete slabs can be more porous than others and soak up more epoxy than estimated in the first coat. This doesn’t take into account what remains behind in the mixing bucket as well as the individual A and B containers. We like to follow the rule of 10%. Once you figure out your square footage, add 10% to that number (up to 1000sf.) to come up with the amount of square footage you need to coat for your garage floor. While a garage floor coating can easily be applied in smaller sections with one person, we highly recommend using two people or more for installation. It reduces mistakes from rushing and you can coat the average 2-car garage floor (not including stem walls) in less than an hour with 2 mixed batches. Learning how to apply epoxy to a garage floor isn’t hard once you understand the finer points of the application process and all your questions are answered. Get your game plan written out if necessary before you start and make sure all your tools are available and ready to go. Good luck and enjoy your brand new garage floor coating! My father-in-law and I applied an Epoxy-Coat kit from Lowes to my 400SF garage, and the project was going well…that is, until it started to rain outside and in our rush to bring our materials under cover from the rain, I spilled about 1/4 of the part “B” activator (in the middle of putting on the color coat!). Fortunately, the clear coat used the same activator, so we borrowed from there to finish the color coat, and it looks like it came out great. But I had to order another half gallon of “B”, which means I wasn’t able to put on the clear coat within 24 hours of putting on the color coat. Hi Matt. It’s not hard to do at all. The easiest for new coating like that is to sand the floor using a pole sander like this one. 100-120 grit sandpaper works fine. The idea is to degloss and rough up the surface. You are not trying to remove any of the epoxy, just provide a rough finish to produce a mechanical bond. You should be able to do the entire floor in an hour or so. After you are done, sweep and vacuum with a shop vac if you can and then wipe down the entire floor with denatured alcohol applied liberally to a towel. This will remove all the fine dust to provide a nice clean surface. After that you are ready to go. We cover it in more detail in an article here for older epoxy floors that need a new top coat. Thanks, Shea — your website was extremely helpful in getting me comfortable enough to even consider taking on a project like this…and if we can just get through this last piece, my wife might be confident enough to let me take on something bigger! One more question for you, Shea. After we put on the color coat (but before the clear), I noticed a few cracks that I must have missed the first time around. I used the gray Rustoleum crack filler the first time around but did not want to use it again because we painted our floor tan — so I used Simpson Strong-Tie Crack Filler, thinking it would dry clear, but it currently looks blue, and the website (which I clearly should have read beforehand) says it will fade to amber with time. 1. if I put on the clear coat today, will the color still fade from blue to amber? 2. what is the best way to remove excess blue crack filler? When I filled the cracks, the material spilled outside the cracks themselves, so there is some excess around the areas that I meant to fill (wouldn’t be an issue if the stuff were clear, but it’s currently blue!). I believe Epoxy-Coat has touch-up kits available Matt. Give them a call for this info. If so, we recommend sanding (40 grit sandpaper) or grinding the repair down flush and then apply the touch-up kit over it. Let that cure and then prep the rest of the floor for your clear coat. If a touch-up kit is not available, the only other option is to sand it down the best you can without going through the surrounding coating. A hard block sander will help to keep you from doing this. The sooner you do this the better because the material gets harder as it cures. The bluish color of the Simpson repair material you referred to will eventually amber, turning to a medium tint dirty yellow. It will still amber with the clear over it, though it will take longer. Thanks, Shea. Given that we’ve already had our garage empty for a week longer than we’d planned (on account of my spilling half of the activator and having to order more), we decided to just put on the clear coat today, so we can start to put the garage back in order that much sooner. I will say that I didn’t have to use nearly as much of the clear coat as I did the color coat when I put that on — I wonder if the floor was less porous, even after I sanded it down with the 120 grit paper, than it would have been if I’d put the stuff on initially within 24 hours of putting down the color coat. Would welcome and appreciate your thoughts re that. Either way, the floor is drying now, and I’m hoping to be able to start putting the garage back in order soon enough. Also nice to know that the blue will fade to amber, even if it takes a while — thanks again for your help! To answer your question Matt, once an initial coating has been put down the floor is no longer porous because the coating has effectively sealed the floor. This is one reason primers are recommended. Coverage rates are always lower on freshly prepared concrete due to the fact that product gets absorbed into the concrete, which is what you want for best adhesion. The second and subsequent coats always go farther than the first. Hello, I am just about ready to paint my garage floor but I am dealing with really fine concrete dust after profiling that no matter how many pressure washer sessions(3 so far with a 3000 PSI washer) I can’t seem to get rid of the dust. Would you recommend the denatured alcohol for this? Hello Julian. Are you going to “paint” your floor or are you applying an actual coating such as epoxy? Was your concrete dusting previously? Also, when you profiled your floor did you acid etch or grind? If you wipe your fingers across the surface, are they coated with white dust or just enough to notice? Sorry for all the questions, but it helps us to evaluate what you have going on. Sorry, I should have better elaborated. I am putting down an epoxy coating, the Rustoleum Professional Epoxy coating to be exact. I don’t believe it was dusting before and I used an edco floor grinder/my hand grinder to profile the floor. In most spots it’s just enough to barely notice whilst other spots there is loose dust that I can move (assuming I didn’t wash properly). OK, good to hear Julian. If the floor wasn’t dusting before, then most likely it is excess concrete dust from the grinding. You won’t get every last speck with proper cleanup. If you run your fingers over the surface, it’s not uncommon if you get a little bit of white powder. Generally you do not rinse out the floor unless you did your grinding wet. Using a pressure washer tends to move the dust around and drive it into the pores if not rinsed in a very deliberate manner. Once the floor has thoroughly dried, use a shop vac on the concrete to vacuum up the excess dust and then apply the coating. 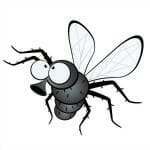 hello just need to know how many kg it need to cover 1 meter SQ ? Hi Ayman. You haven’t provided us enough information to give you an answer. However, you can use the following information to do the math. We will let you do the conversions. 1 U.S. Gallon of 100% solids by volume will cover 1604 sq. ft. at 1 millimeter dry film thickness. If you are dealing with anything less than 100% solids, multiply 1604 by the percentage of solids by volume to determine the amount of square feet. Keep in mind the dry film thickness of anything less than 100% solids by volume would need to be determined by multiplying the wet film thickness by the percentage of solids by volume. Using the above formulas as an example, a 50% solids coating applied at 4 mils wet film thickness will cover 401 sq. ft. and have a dry film thickness of 2 mils. I bought 2 Epoxy DYI kits from Rust-Oleum. I was wondering if I could apply one of them as a first coat and then another as a second coat? I want to achieve better/thicker coverage and durability. Hi Igor. Yes you can. You will actually get better color uniformity and gloss this way as well. Just be sure to wait the appropriate time before applying the second coat. I had my garage floor epoxy finished with clear coat about 3 yrs ago by professional. We used Rhino epoxy kit and had H&C clear gloss acrylic coat as top coat. Now the gloss is fading away and having tire marks. I am planning to reapply the clear coat to get the gloss finish. Can I do a solvent based when we did a acrylic base top coat 3 years back or should i go with the same clear coat as before. Please advice. Thanks for your great service. Hello Bob. Epoxy or polyurethane (solvent based) will be a much better top coat than the acrylic. Just make sure the acrylic sealer is completely removed first. We talk about how to do that here. Hi. My hubby is familiar with the whole process. He has done MANY garage floors. The garage floor came out fine as usual but the floor has two different shade colorings. The small area that begins from the furthest interior wall and is seamed looks it almost has not completely dried. The whole garage is flaked. The both areas are dry but 2 different shades. Do you know what can cause this and how can I fix this? Thank you. Hello Victor. You didn’t state what product was used, how many coats, and etc. There are many reasons for the shade of color not being consistent. It could be from not mixing the Part-A colored batches together first if more than 1 was used. It can be from applying it thick at first and then stretching it out later. It could also be the concrete being more porous in areas. If only using 1 color coat of a lower solids epoxy, the concrete can absorb more in areas creating thin spots that look less glossy and a different shade. Unfortunately at this point, the only thing you can do to make the color consistent is to apply another color coat. More than likely it’s a coverage issue, as stated by Shea. If the coating is thicker and not back rolled, the chips tend to sink into it, creating a “shiner” for lack of better term. These chips are not laying on the surface, but in the epoxy giving the chips a slightly different shade of color. If this is the case, and the area is small, you could always apply some sealer to the effected area, and add some flake on top, let cure and put on some sealer again. Too many variables to give a complete answer…add some photos! I want to put a clear top coat on my floors once I lay the epoxy but I want a good enough shine so I’m thinking about putting 2 coats on. I know you shouldn’t put a thick clear coat on but is there a time frame in which I can lay the second layer of clear without having to rough it up again. Is it the same rule of thumb with the base layer with the thumb print trick. Hello Mark. Your highest gloss comes from high performance polyurethane and polyurea/polyaspartic coatings. You can read more about top coats here. Creating a thicker clear top coat will improve the durability of the floor, but it won’t necessarily improve gloss. Gloss is only affected (in a negative way) if the coating is too thin. Most top coats have a 12-24 recoat window in which they chemically bond together. If you wait more than 24 hours for most products it will require roughing up the surface. Always check the TDS for the product used for proper recoat windows. I bought the colored 2-part water-based epoxy garage floor coating kit made by rust-oleum and I have spent some time reading articles to understand the process. If I understand correctly, the recommendation is to have 3 applications ( primer, epoxy & topcoat). Does this also apply when using the DIY garage floor coating kit? Based on what I have read, I would like to apply an epoxy primer. Then, apply the 2-part water-based epoxy and lastly use a polyurethane top coating. Is this correct? What epoxy primer and polyurethane top coat will you recommend? Hello Jorge. You may want to read this article first before you start your project. The Rust-Oleum water based garage floor epoxy kit is an entry level garage floor coating kit. It does not need a primer since it is low solids and will get good penetration. You do have the option of applying a clear sealer however. Rust-Oleum offers a clear epoxy if you want to stay in the same family. If you want polyurethane, these here are a good example of quality product from a vendor that sells them. This combination will provide better protection. A proper epoxy primer is actually more expensive than the water based Rust-Oleum kits and offers better protection. They are used for the higher solids, commercial quality coatings. As with the previous example, you can find a vendor that offers a primer, high solids epoxy, and various top coats for the high performance DIY garage floor coatings right here. Outstanding article. One important thing I did not realize is that polyurethane has a 2-4 hour pot life compared to epoxy at under an hour. That helps since I have over 700 FT2 to do. I want to apply an epoxy coating to my new construction garage floor. My question has to do with profiling the garage floor. I would like to avoid having to grind or acid etch the garage floor if possible. If I have it poured with a brush finish on the garage floor rather than the normal smooth finish, will this be sufficient to obtain good adhesion on the epoxy , or will I still need to grind/etch the floor? Hello Mike. Epoxy adheres by penetrating the surface of the concrete in order form a strong mechanical bond. In order to do this you need to properly profile the surface. Contrary to what many assume, new concrete needs profiling more than old concrete due to the smooth surface created from troweling. A broom finish surface is not good for an epoxy coating. It requires much more epoxy to smooth out properly and the thin concrete ridges that the epoxy bonds to is not strong enough to withstand impacts and can cause separation of the epoxy from the surface, with the concrete ridges still embedded in the bottom of the epoxy. If you want to avoid profiling, there is only one product on the market that is currently available that forgoes profiling in most cases. It’s called Rust Bullet. As long as your contractor does not use a cure-and-seal on the concrete and does not power trowel the surface it can be applied without profiling. Hi – I really enjoyed your article – any wish I had read it BEFORE I put my first coat of Epoxy Master paint on my 2-car garage floor. I did the painting when it was too hot and I have a dreadful patter of large bubbles that have popped leaving me a floor that looks a bit like the surface of the moon. Additionally, I used the coarse anti-slip grit that was provided, spread by hand and it does not look great either. So, following their recommendation I am sanding this coat, and removing the anti-slip grit (wow!) and will put on a second coat. I want to use a less aggressive anti-slip grit this time around. I’m using the two-part Epoxy Master paint which has about a 35 minute working period. Your article recommends putting a powder-like anti-slip into the paint before application. Can I do this with the Epoxy Master which is fairly viscous or do I need to broadcast it manually after painting? I really appreciate your help – I need to get this right this time around! The EpoxyMaster product is an excellent 100% solids epoxy coating Doug. As a result, it goes down very thick. The problem with using the less aggressive polymer grit that you mix into the epoxy is that it can sink some in thick coatings after it has been applied and not be very effective. You can spread it by hand afterwards and it will not be nearly as aggressive as what you used previously, but we personally have never liked the look since it’s more visible and never gets distributed evenly. It’s really up to you. Our recommendation is to apply the high performance polyurethane clear top coat that EpoxyMaster sells and then mix the less aggressive polymer grit in that. Polyurethane goes down thin and that type of grit works very well in it. Plus, you would gain the advantages of a clear top coat. Thanks Shea, although I’m not sure yet which way I’ll go! As I’m doing this in Canadian $ the price is escalating, particularly since I didn’t anticipate doing a second coat. The EpoxyMaster clear top coat is pretty expensive…and I can’t get it in Canada other than being shipped in from the US. Do you know if any clear polyurethane coating will adhere to the epoxy? If not, I’m probably going to try mixing the anti-slip in the paint – if it doesn’t work I can always fall back to the clear coat option. It can’t be just any clear polyurethane Doug. This article should help. It needs to be a polyurethane for concrete coatings. I’m sure there must be a Canadian source if you do some searching. I just put down a coat of epoxy armor base coat and spread out using the sqweegee only. The idea was to put down this as a primer coat. The directions for primer coat was to not back roll. Now it is uneven and looks bad.. I have about another 1.5gal of this same base coat I am going to put down and back roll. My question is will this 2nd coat fill in the sqweegee marks and unevenness? Any tips? Should I buy another 1.5 gal and go more heavy? sand down where it is heavier? I put it down about 16hrs ago. Hello Colin. The primer coat is also known as the ugly coat. It will look blotchy and patchy in areas. It should have a somewhat even surface, however. If you have ridges from the squeegee then those should be knocked down by sanding before you apply the other coat. The other coat should smooth the rest out if you knock down those rake marks. It will most likely still look ugly though. That is normal. You should not have to buy more primer. Please help! We had the epoxy floor done and a staff member walked onto the wet floor before it got the second coat. He then stepped onto a second area where the epoxy was already dry, leaving ‘wet’ sticky footprints on the dry floor. How can I remove the dirty footprint marks? Thank you. Ugh… Unfortunately Sonja there is not much that you can do other than sand those areas to remove the prints and apply another coat. We are having a new home built in Reno, NV and are thinking of having an epoxy coating put on the concrete floor of our 20′ x 20′ 2 car garage. The builder want $1900 for this option. Do you have a ball-park idea of what an outside contractor would charge for this job? Thanks in advance! That’s right in the ballpark depending on materials used Tom. You may want to review this article on how to find a contractor in order to make the best decision based on your needs. How should the floor feel to the touch after it is complete? When I run my hand over ours my hand catches on the flakes and has a rough feel. Is this normal? Hello Holly. The feel of the floor is dependent on the amount of flakes applied, what type of top coat was applied (if any) and how many coats of a top coat. Also, how well the flakes were knocked down for a full flake floor makes a difference as well. For example, a floor with a moderate amount of flakes applied with only 1 coat of polyurethane will have an irregular feel to it which is normal. The more top coats applied the less irregular it feels, but it rarely feels glossy smooth unless no flakes were applied or multiple coats of a thicker top coat was used. HI. my question is on fixing an area of the garage that was previously sealed. My son decided to change his car oil inside the garage and the oil spilled and then he didn’t clean it and dried. He then used a “project cleaner” which removed the epoxy from that area (about a 1 1/2 feet section), very visable. I still have some of the Everclear epoxy remaining from last year when we originally had the garage sealed. I have cleaned the affected area with soap and water to remove the residue of the project cleaner and it is now dried. Can I just use a brush to apply 2 coats of Everclear epoxy? Hello Robin. Epoxy cannot be removed by cleaners, nor can you have extra just sitting in a can. Based on your description of what happened, it sounds like you may have an acrylic sealer applied on the concrete. Is the brand called Everclear made by Euclid Chemical? Some acrylics, particularly if it is water based, will do exactly as you described. If this is indeed what you have, then yes, you can apply it just as you asked. that is exactly the one that I have! I will ensure the concrete is clean and will apply. Thank you for including the acrylic sealer link, that will help. I intend on putting the Rustoleum residential 2 1/2 car garage epoxy Tan color on my floor tomorrow, or is the commercial better for simple use? New house/ concrete, etched the floor, blue tape on the concrete boarder I already painted in a chocolate color. I used a liquid concrete patch mix in a bottle for hairline cracks and some little holes, then I did the etching and watering and the leftover on top came off rubbery. Was that product a mistake, too soft or soft over time and should I have etched first, then concrete fix? The tape on the boarder, do I need to take that off 30 min after rolling the floor? Is epoxy skin like and comes off when I pull the tape later? I have a 9 inch concrete lip past my door, then red bricks as my driveway. Do I leave it untreated gray concrete, use my Tan epoxy and or apply some UV coat on it from preventing it turn yellow, or is there another solution for it to blend in? Hello Triton, I hope this reaches you before you started. Higher quality product is always recommended over lesser quality product if the budget allows it. In terms of your crack repair product, it sounds like you used a latex product. These are too soft and will deteriorate if an acid etch is used. Some are not paintable as well. 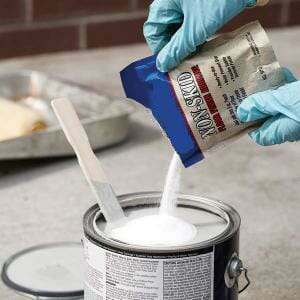 It important to use the proper crack repair products when coating concrete. Remove the tape after 30 minutes or it will not separate. In terms of your concrete lip, epoxy will yellow if exposed to the outdoors regardless of any U.V. additives added to it. A polyurethane clear top coat will slow the process down, but it will still yellow. The only solution if you want to run it outside to coat the lip is to use a colored polyurethane base coat over the epoxy or use a polyurea or polyaspartic coating on the floor. We did everything as recommended but my husband missed the part about sanding down the sealant used to fill in the cracks. He painted the 1st coat using Rust-Oleum Epoxyshield 2 part gloss floor coating. It has dried the suggested amount of time and now you can see all the places he used the sealant. Would putting another coat of the colored epoxy down before putting on the top coat solve this issue? I don’t mind doing so but if it’s not going to fix anything I am not going to waste the money. Also, we have 2 small children would you suggest using the anti-slip additive to help prevent falls or would you skip it for it might be too rough on their feet. (many times they choose to run around without shoes on.) Thanks for your help! Another coat is not going to fix the issue Jodi. It needs to be ground flush in order not to telegraph through the coating. The anti-slip additive that Rust-Oleum sells is kind of rough for bare feet. The floor may be a little slippery for the first month or so without it, but it will we less so after that. As long as you are careful about walking on wet spots you should be OK. If you live in a climate with lots of wet weather or snow that gets tracked in the garage, then the anti-slip additive may be a good idea regardless. So at this point in regards to the sealant telegraphing through what are my options? As we said Jodi, the only thing you can do is grind it flush and recoat. Repairs like that can’t be fixed with more coatings. It’s like a dent in a fender that was repaired by using a filler. The filler has to be sanded flush and smooth so when it’s painted over you can’t tell where the dent was. If the sanding is not done, no amount of paint will hide it. Thank you I appreciate your help. If I am cleaning grease stains out of the cement for prep, is it better to scrub the stain with a water/detergent mix or let sit overnight? Hi Chelsea. If you are doing a water detergent mix you do not want to let it sit overnight. If you do it will dry out and not be effective. Let it sit for a while (5-10 minutes) without drying out, then scrub and rinse. Thank you! I finished my garage over the weekend using the rustoleum kit. It’s not as shiny as I was hoping for. Should I look at options for a top clear coat or would you not recommend that? Hi Chelsea. The Rust-Oleum product is not commercial grade and will not be as shiny as higher solids epoxy. However, if you apply a clear coat it will increase the gloss as well as the durability of the floor. You have a 76 hour recoat window with Rust-Oleum. If you exceed that window you will first need to rough up the surface with 120 grit sandpaper before applying the clear. We have an article about clear coats here. Hi Shea, What 3/8 nap can I use for epoxy shield professional.. i am not seeing any 3/8 nap for epoxy in the home improvement stores. And also for clear coat rustoleum recommends a 3/8 roller nap. will a lint free microfiber 3/8 nap be used? Home improvement centers are not going to carry roller covers exclusively for epoxy coatings, Prem. You will do OK with a premium roller cover such as Purdy or Wooster. Just make sure to run the roller over a long strip of duct tape or sticky tape before you use it. This will remove any loose lint. Use a strip of tape about 3′ long. Stand on one end while holding the other end with your hand. Use your free hand to run the roller (attached to the frame) back and forth across the tape while keeping it tight. If i hv floor 4 m×10 m how much material i have to need to paint flooring? Hello Reni. It all depends on the type of product you want to apply. The coverage rates vary based on mil thickness and volume. The manufacturer of the product you are interested in will have that information. The general rule is that 1 gallon of epoxy resin will cover 1608 square feet at 1 mil thickness or .001 inch cured thickness on a smooth and non absorbent substrate. Hi Dennis. Rust-Oleum allows up to 72 hours to recoat. After that you will need to degloss and rough up the surface with 120 grit sandpaper. There are many, many companies that do it for a living Wanda. Just search “garage floor coating ‘your city'” and they will pop up. This article here will help you out as well. Will Epoxy primer (mixed with acetone) like the ones sold by Epoxy master, followed by an epoxy color coat (also sold by epoxy master), followed by a polyurethane top coat last longer than this Nohr-S kit in your opinion? The Nohr-S kit I put a link too uses a epoxy primer like the ones sold by epoxy master followed by 2 coats of Nohr-S polyurea right? Hi Jeff. Both systems are going to offer very long life and be very durable for your Michigan winters. That said, the EpoxyMaster system is going to provide a thicker overall coating than Nohr-S and stand up to abuse slightly better as a result. It also provides a better medium in which to apply full color flake coverage if that is what you are interested in. Since polyurethane goes down fairly thin, we would suggest a minimum of two coats. In terms of application, the Nohr-S system is easier to apply since you have much longer pot life and it does not require mixing of two components (with exception to the epoxy primer). How about about the LI standard epoxy primer, followed by a coat of epoxy master 100% solids, followed by 2 coats of Nohr-S polyurea. Would that be the most durable and longest lasting system I could go with? Is it worth the extra ~30% on my investment to add the epoxymaster 100% solids in between the primer coat and the 2 polyurea topcoats? In your best estimate how much extra life/durability am I adding to the floor by doing so? The extra thickness that the epoxy provides adds durability in terms of heavy abuse such as dropping objects, impacts, and etc. A full color flake option increases that durability even more. The top coat is what creates the wear resistance. If you read this article about data sheets, there is a good example of this when comparing abrasion ratings. The wear rate of the floor will not change if the top coat remains the same. However, the overall thickness of a floor coatings system helps to determine how well it stands up to abuse. So in short, the 100% solids epoxy color base coat will increase the durability to abuse and is worth the investment if you have a busy garage and plan on subjecting your floor to a lot of use other than just parking your cars. If all you are going to do is park your cars in the garage, then such a base color coat may not be worth the additional investment. Also, what’s nice about a quality system with a good top coat is that 10 years or so later you can sand the surface and apply one new coat of clear and it will make the floor look brand new again. Legacy Industrial has a 100% solids epoxy as well, Jeff. If you plan on applying such a system, it’s best to try and stay within a vendors own line. This helps if there is ever an issue with product. I plan on doing 2 coats of 100% solids epoxy with the last coat getting an average amount of flakes/chips. Followed by 3 coats of a 2 part ployurethan top coat with the last coat of top coat adding the ploymer grit. I want to add a nice hint of glitter also. When would be the best way and time to add the glitter? I want the floor to mainy show the epoxy colour and chips with just a hint of a glitter. Hi Stacy. That is going to be one tough floor. Also, don’t forget to use an epoxy primer for your very first coat when using a high solids epoxy. As far a the glitter goes, we suggest broadcasting it onto the first coat of polyurethane that you apply. Use small pinches and throw it high in the air to get good dispersion. If you toss it at the floor you will get clumps and lines of glitter.